The guitar hasn't quite followed the evolution of its creator ─ the homo sapien ─ and still cannot stand up straight on its own. 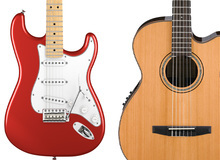 So, after having to break that news to you, let's look at the different options to keep your guitar standing safely. Before we begin, do remember that guitars with nitrocellulose lacquer are incompatible with most stands and, thus, need an extra layer (any cotton cloth will do fine) between the instrument and the stand. Like our feline friends, guitars don't mind being held by the neck. 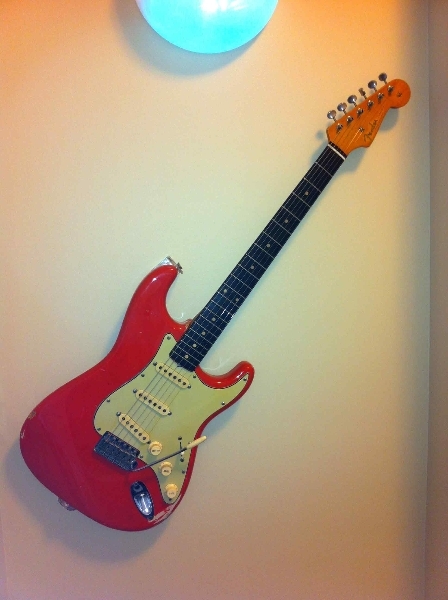 So, if your mom/partner/owner (select the appropriate option) is understanding enough to allow you to hang it on the wall, your guitar won't suffer any consequences, even if it hangs for a prolonged time. You can use a standard, not-too-expensive stand, like the one on the image, however, the botched finish on entry-level stands of this type might not be entirely satisfying. 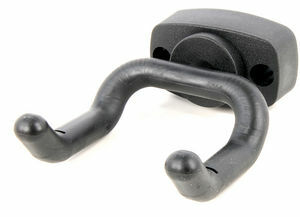 More demanding guitarists will go for a self-locking system, like the ones made by Hercules or Ultimate, whose grip closes around the neck when you mount the guitar, offering thus a much appreciated additional safety, which is also practical, because you only need to pick the guitar up to unlock it. If aesthetics is your main criterion, there are several models that bet everything on design, like those of Guitar Grip. 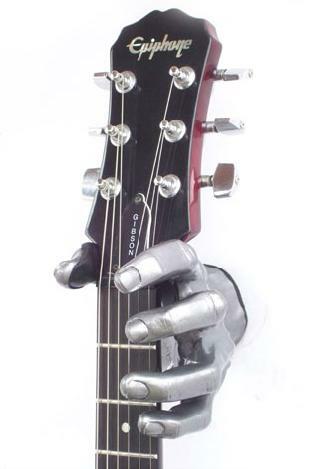 Finally, there is yet another model that is both practical and aesthetically appealing, which holds the guitar by the strap pin, allowing the most daring eccentricities you can think of. 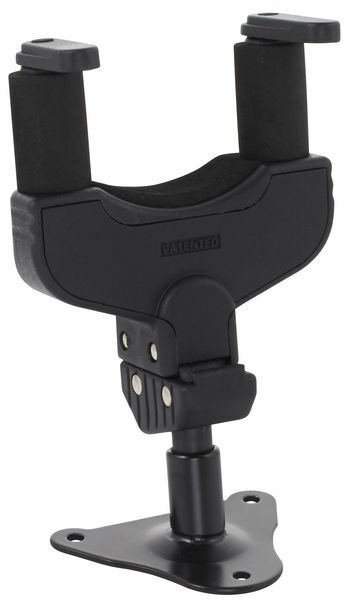 Marketed by Woodies, there are several versions available, depending on the position of the strap pin. Even if you can hang your beloved from the wall, you will hardly find a hospitable-enough rehearsal room owner that allows you to make a couple of holes on the wall to do it. So, let's see the options available to keep your guitar safely on the ground. Since the choices are endless, we will distinguish between standard, compact and "travel" stands. The latter can be easily fitted in the guitar case and come in really handy, but offer no protection to the neck in case it flips forward. To avoid such inconveniences, the best is to get a bigger model with a locking system, like the ones mentioned above, available from the same brands (Ultimate and Hercules). 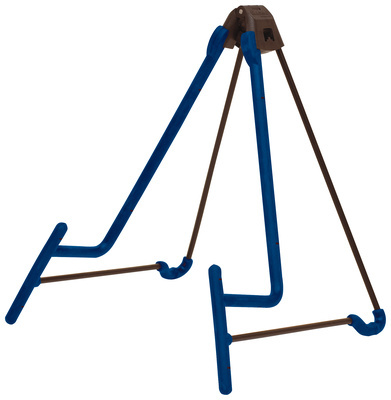 They are more expensive and harder to transport, even if they are relatively compact once folded. Another hybrid solution that can thrill those who want to save as much space as possible consists in a strap fixed to the amp (or cabinet if you have a stack) with a Velcro fastener. 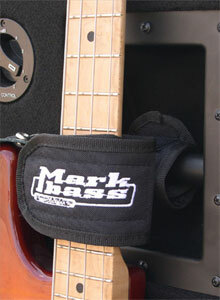 Even if it's called a Bass Keeper, nothing stops you from using it for your six-(or more)-string beauty. 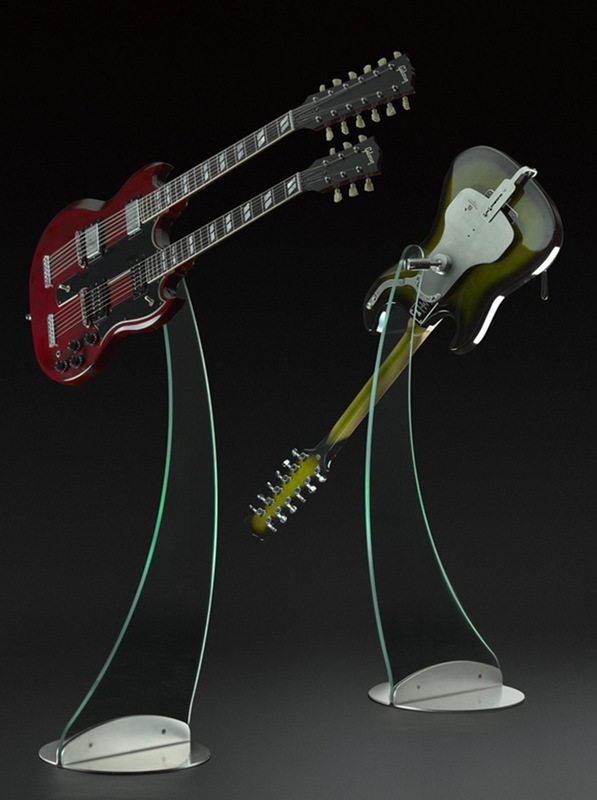 To wrap it up, the most eccentric (and fortunate) guitar players might want to take a look at the astonishing Aclam system, an aerial stand with a stratospheric price to go with it.